University of Saskatchewan cow 944 is a thoroughly modern bovine, which means she turns to technology when she needs to be milked rather than relying on humans to do the job. The robotic milker in action. 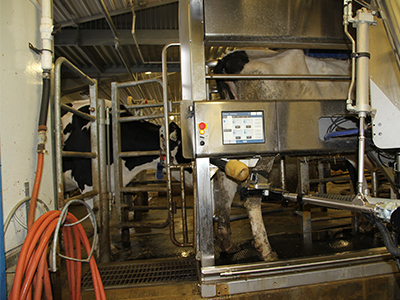 Number 944 is one of 39 cows in the herd that uses the Rayner Dairy Teaching and Research Facility's automated milking system, essentially a robot that handles the thricedaily milking requirement of each animal. 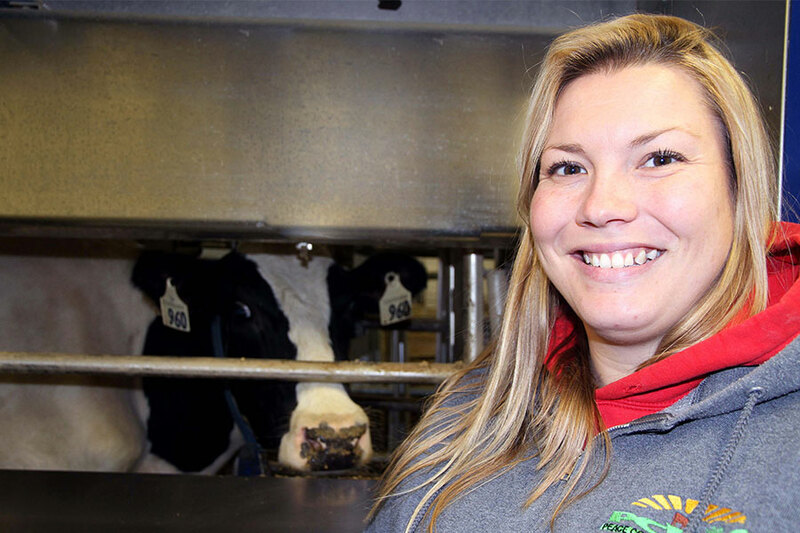 For Morgan Hobin, facility manager, the system is an important management tool, freeing up dairy farmers and staff "from milking three times a day so they can direct their time to other duties like management, nutrition and animal health." She explained the cows access the system on a voluntary basis. Each wears an electronic tag that the robot recognizes; if the cow is due to be milked she is admitted to the narrow milking stall. If not enough time has passed since her last milking, a series of automatic gates directs her out of the milking parlor and back to her stall. Once the cow is in the stall, a predetermined daily allotment of grain pellets is dispensed into a bin in front of her, one third for each milking. Then the robotic arm goes to work under her, first rinsing her udder and then, using a laser-guidance system, attaching suction teat cups to each of her four teats. Hobin said the system can be programmed with each cow's teat configuration and if, for example, one quarter of the udder is dry, can be instructed not to attach a suction cup to that teat. As the cow is milked, the system records the milk flow from each teat and total milk produced. On an office computer, Hobin and other barn staff can see which cow is being milked, monitor each cow's milk production over time, and are alerted by the system if a milking is incomplete. The screen also alerts staff when a cow is past due for a milking. "Then we go find her and push her through, but we also check to see if something might be wrong like she's lame or has mastitis (an infection in the udder tissue). Or, she might just be lazy." When the milking is complete, the teat cups detach and the robot sprays the udder with iodine. After the cow leaves, the stall is automatically rinsed with water before the next animal is allowed to enter. The robot also cleans itself three times a day, said Hobin, running water and detergent through all of its pipes and hoses. But like all technology, the robot does occasionally experience technical difficulty. When that happens, it contacts the cell phone of on-call staff members who then affect repairs and clear the situation. "And as we learn more about the system, it's easier for us to troubleshoot the little things," said Hobin, who has a master's degree is dairy nutrition from the U of S.
"It's great technology," she continued. "As a university, we're the ones who should be using this technology and be leaders in the industry. It's our role, as is sharing with dairy farmers what we know." Hobin expects the next evolution in automated milking will come with software rather than machinery, and will likely involve analysis of milk as it is flowing from the cow. She has noticed, though, that the voluntary milking system highlights a very clear pecking order among its users. "They definitely have a hierarchy as to who gets to go first. One cow will be waiting to get into the robot and another will come up and simply push her out of the way. It's quite entertaining to watch them back there." The system is also proving entertaining for visitors to the facility. "When people come for tours, they always want to see the robot. They think it's the coolest thing." The Rayner gallery, which includes an interpretive centre and overhead walkways through the barn, is open seven days a week from 12:30-4:30 pm for selfguided tours. Hobin advises 1 pm is a good time to visit to see the cows being milked.